This painting, created at the ACRE Residency, is based on an 1835 engraving in R. Havell's A Collection of the Birds of Paradise. The print's original title was so wonderful that I could not resist appropriating it. 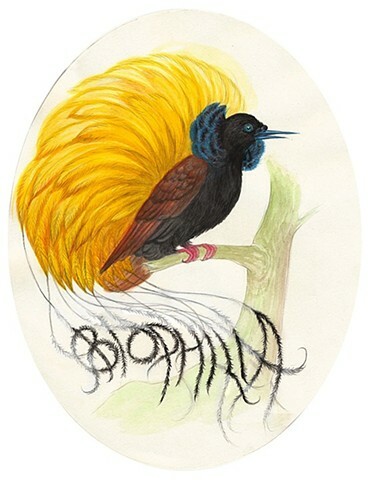 With the bird of paradise's special elongated tail-feathers, I have spelled out "Biophilia," a term coined by the inimitable myrmecologist, naturalist, conservationist, and personal hero of mine, E. O. Wilson --- to whom this piece is dedicated.